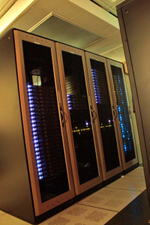 The Brandeis high performance computational cluster (HPCC) is comprised of 155 computational nodes, each of which has 8 or 12 cores ranging in clock speed from 2.50 GHz to 3.16 GHz. In addition, 5 nodes of the cluster are connected to 12 NVIDIA GPUs. The HPCC has about 36 TB of storage and is administered by John Edison.